But why do I need a dome tent or an igloo tent? Human beings are used to having a roof over their heads at all times. This is true whether your home is a safe haven or a shelter from wind and storms. But if you want to go on a voyage through nature, you have to leave behind the four walls surrounding you. You have to trade your beloved home for the Spartan furnishings of a dome tent. To preserve comfort during expeditions, multi-day tours, and even simple camping, modern igloo tents offer adequate space and a highly-robust design. They allow a certain sense of home to emerge in all corners of the world. Igloo tents have a decisive advantage over simple tunnel tents in that they can withstand far greater stresses due to their rounded design. This means that at least two pole arches are secured diagonally across the center of the tent. If necessary, the residual stress should allow the tent to stand on its own without being fixed to the soil. Thanks to this stable construction, the dome tent provides far better protection against natural forces generated by wind and snow. 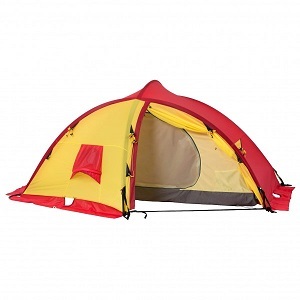 The larger number of pole arches make dome tents considerably heavier. However, they are veritable fortresses against rain, snow, and storms for this very reason. Dome tents are primarily used in expeditions, and camping, and multi-day mountain hikes. They have enough space for two to five people, possibly even more. Most igloo tents have a separate tent body that hangs from the pole arches with two outputs depending on the design. The most common dome tent materials are polyester and polyamide. This fabric is often combined with an additional coating made of silicone or polyurethane, improving weather protection. Dome tents aren't just reliable shelters from wind, cold, and rain. Depending on their size, they can also serve as base camps, baggage stations, and outdoor kitchens. With that said, an igloo tent is much more than a brittle snail shell. In fact, it's entirely capable of replacing your beloved home - at least for a short time.